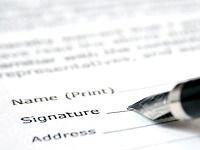 Home » Atlanta REIA Blog » Articles » Are Option Agreements Legal? In a column I wrote two weeks ago, I made the point that Options are the most powerful and underused documents in real estate. After the column ran, I got a call from a long-time realtor. He had some questions about Option Agreements and offered to buy me a cup of coffee. I said yes because, as you may know, I love free coffee… and a doughnut! He gave me a very skeptical you’ve-lost-your-mind look. After he pulled out one of his GAR forms, I had him turn to Page Three and look at item 11-A-1. It read: Contract is an Option Contract. You could have pushed him over with a feather. I used the following example – which is a deal Kim and I recently did – to demonstrate one of the ways an Option can be used to make an impossible deal possible. About a year ago, Kim and I bought a $150,000 property for about $65,000. While we hosted an open house, a very nice couple stopped in. The couple loved our property, but could only qualify for a $120,000 mortgage. For most sellers, this deal would be dead, right? But not if you have the Option tool in your deal-structuring toolbox! Here’s our agreement: 1) We sold the couple the property for $120,000…$30,000 below market value. (You’re probably thinking that this was pretty stupid of us, right? Just remember: Stupid is as stupid does!) 2) At the closing, Kim and I netted a $50,000 profit – Cha-Ching! 3) Because the couple was buying at way below market, they agreed to pay all closing costs – Sweet! 4) For $10, the buyers sold us a Purchase Option. This gave us the option to buy the property back at any time within the next 12 years at a purchase price of $120,000 – the same price as the couple’s purchase price. 5) We recorded our Option and secured it to the property using a Security Deed. One more thing to add: We also agreed that if/when we exercise our Option, we’d turn around and immediately sell the property. Anything the property sells for above $150,000 – the property’s fair-market value at the time the couple purchased – we’d split 50/50 with the couple. Was this a Win-Win deal? You tell me. The couple was able to buy a nice home, in a wonderful neighborhood, at a price they could afford. We were able to quickly sell the property, make a nice chunk of change, and because of the Option, have the opportunity to make a lot more money further down the line. Think about this: We can buy this house back at a purchase price of $120,000 at any time between now and 2022. Sure, property values are down today, but don’t you think there’s a good chance that by 2022, this property will be worth more – and probably a good bit more – than $120,000? We L-O-V-E Option Agreements because they can help you make the impossible deals possible! I met you at the last Atanta REIA meeting –I think it was October. You gave me your card so I could call you to attend one of your meetings. I just moved to Atlanta in September so I am interested in starting to invest in the Atlanta. Would you send me info about your next meeting. If you want to call me my home phone number is 770-842-0707. P,S. I joined the Atlanta REIA at that meeting, so I am a member.